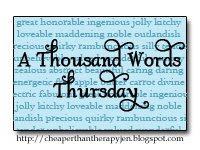 Check out Jen's blog Cheaper Than Therapy for more ATWT posts. Can you tell what is on my mind? SUMMER! Thanks for visiting my page!! I look forward to following you!! I love new followers!! What a great pic. I used to love slip n slides. LOL! That looks like fun! You know, we tried this the other day and the kids just could not get the hang of it... maybe my yard is too flat, maybe they are slip n slide challenged. It was funny to watch nonetheless. We have the same slip-n-slide. We put it on the bottom of our slide, even more slippery fun that way! Thank you for following my blog. It's lovely to "meet" you!